Big Hammocks are designed to hang outdoors in the sun or rain for many years. They are made with over 1,000 feet of thick woven polyester line. It feels soft and glides easily against your body for a comfortable fit in the hammock, yet it is also very resistant to sunlight, moisture and mildew. The tropical hardwood is MAI-TENG from Southeast Asia. This won't rot and bugs resistant. The design of these hammocks allows for a very relaxing sleep beneath a tree, alone or together with your partner. The wood spreaders keep the hammock wide open. The sliding lines gently contour to your body, and the stainless steel rings won't rust. This design is similar to the famous Pawley's Island Hammock from the USA and there are three sizes to choose from. We can ship these great products anywhere in the world to you! Thank you for your interest in our big Hammock. If you would like to buy a Big hammock, please add the Shipping Charges below, then you may pay by PAYPAL. We ship by surface, because it is cheap and easy. If you want your Big Hammock sent by Airmail, Then please Email us your post address and we will get a price quote for you. Net Size : 150 cm. x 215 cm. 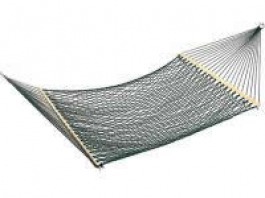 Net Size : 100 cm. x 180 cm. - Shipping in Thailand 350 B/ each.We ship by EMS takes 2-5 days . - For International shipments, we ship at cost price. Cost will depend on type of hammock and final shipping address. - We normally send by surface mail which is cheaper but takes more time. 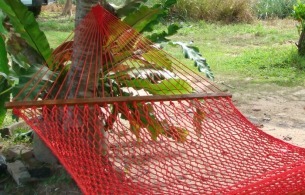 In case you prefer your hammock to be send by airmail, additional charges will be applicable. In case your hammock is not to your liking, you can return it to us. Once received in good condition, the money will be returned within 7 days (excluding shipping expenses).